Home BadassBotanists Eyes down (the hand lens) for a full house! 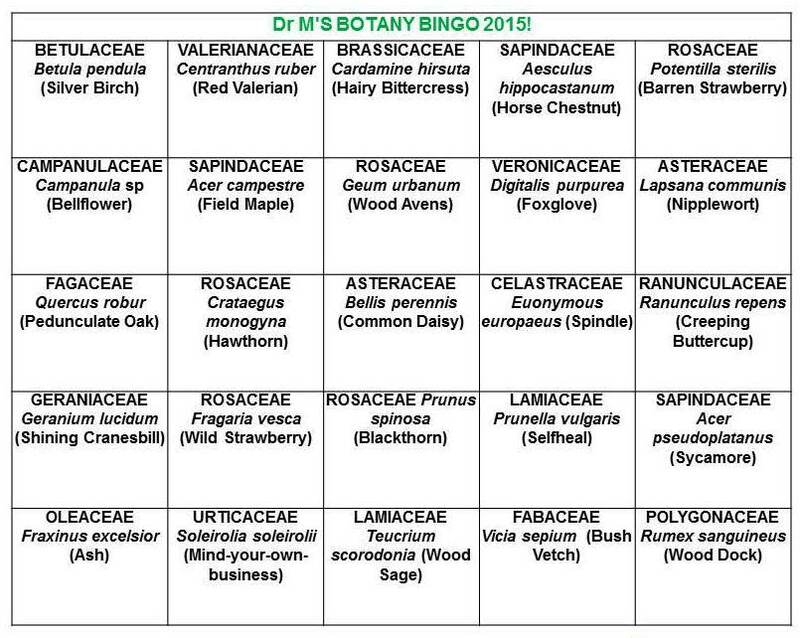 Dr M’s Botany Bingo! Finally the day arrived for the latest plant ID test for Dr M’s MSc students, but no ordinary test this one, instead it was to be – Drum Roll – Dr M’s Botany Bingo, yes that’s right Botany Bingo! Unfortunately Dr M was in process of recovering from a flu virus and so instead of the deluxe boxed set of Botany Bingo he had planned (lavishly illustrated with bespoke printed bingo cards and all) he only just had enough energy to provide from his bottom-shelf basics range. 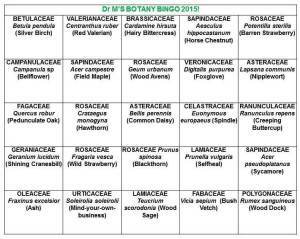 Dr M’s Basics Botany Bingo? Well this is where Dr M crawls from his sick-bed and places 25 numbered plants in the lab and the students, working in five small groups, draw out a five by five grid square and order the 25 numbers in any way they wish before being introduced to the 25 numbered plants in the lab. Having drawn up their cards, and having the 25 plants to hand, each group set about identifying them and trying to score complete rows or columns and ultimately a full house (all 25 – Bingo!). The 25 included some winter twigs to revise what was covered the previous week, then some familiar plants like Ranunculus repens (Creeping Buttercup) and Prunella vulgaris (Selfheal) (which being such a morphologically variable plant still seems to confuse and baffle students more often than any other plant Dr M knows of!) and some instructive comparisons like Fragaria vesca (Wild Strawberry) and Potentilla sterilis (Barren Strawberry) and some new families like Campanulaceae with its lovely white hydathodes! Several groups scored correct rows and columns during the 60 minute time slot before the coffee break but no group quite managed a full house, to be fair this was at least partly due to the less than perfect nature of the January-collected material not being in best condition. Some of the plants were not quite behaving themselves (according to the available keys at least), for example Vicia sepium (Bush Vetch) has 5 or more pairs of leaflets according to the veg key but Dr M’s material had 3 or 4 only! Here is the completed bingo card and Dr M thinks a great way to make a plant ID test accessible and fun and still with learning outcomes! (click on the image for a better view). With thanks to Stephanie Bird @symphlythebest for the idea developed from her own field course teaching. Dr M ill ?! Was it oysters again or gin? Ha ha! Nothing so exotic, most likely caught from @RNGBotany! Wish we had botany bingo when I did your course. I have learned something new, Sapindaceae! I guess Aceraceae was another casualty of APG!